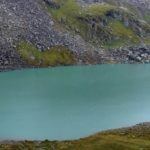 Vasuki tal is 8 kms. from Kedarnath, at a height of 4135 mts. 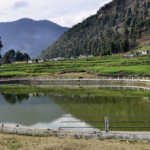 The lake is surrounded by high mountains and offers an excellent view of the Chaukhamba peaks. It is situated on the Chopta-Ukimath road about 2 kms. from road head at Sari village. This lake has captivating surroundings with forest all around. 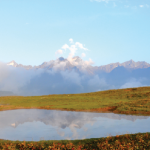 Te reflection of the mighty Chaukhamba peak in the lake creates a beautiful effect. The road is motorable upto Sari, 10 kms. from Ukhimath and from there one has to trek about 2 kms. All arrangements have to be made for a night halt at the spot. It is located at 4 Km from dharkudi village of block Jakholi. It is at elevation of 7000 feet from sea level.it is famous for it colour full fish spices. spread at area of 500 sq mt. Each year Baishakhi fair organised here.